This is a great set for a small patio. We love it. It's also done great and held up very nicely through the rainy season. Dimensions 34.0 In. X 34.0 In. X 59.0 In. Beautiful looking. Only problem is that the table is out of plumb and two of the chairs don't fit between the legs of the table. We were very happy with our purchase. Product was packed very well. Easy to assemble and gave an an additional screw in case an original was missing or got lost. Product is solid and excellent for the price paid. Cushions are good quality as well compared to other products we have received in the past. Very happy with this high-top seating. Sturdy, clean lines and easy assembly. Would recommend. We have a small patio area and it was hard to find a small, stylish seating set. I am totally please with the look, size & quality. Highly recommend. 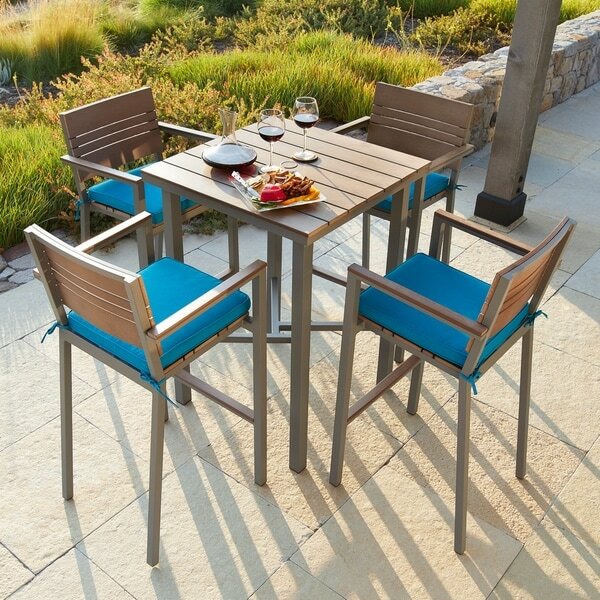 We like the utility of this set and its extra height really helps keep our view of downtown available even when sitting down. I like the fact that the "wood" won't have to be resealed over and over. Love this set ...even though initially, i had problem to climb up the chair ( i m short and needed some help) now I am an expert and are very very comfortable. Really love this set. I have it on my patio and receive tons of compliments!! Great set. Doesn't need to be put together. Solid. Love the simple style, color and footprint for our space. Coordinated with another conversation set. Glad summer is not over yet to enjoy it! "I see the answer that there is an umbrella hole, but trying to imagine where the umbrella pole and base would go, as the pictures show an x-base to the table." The umbrella pole is in the center of the table which’s able to secure the umbrella from moving. The bottom of your umbrella will stand on the x-base. "Is there an umbrella hole in the table?" Yes, there is an umbrella hole. "Is there anyway to special order an extra table?" At this time the table is not available for individual purchase. "What is the weight limit? 220lbs ok?" "What is the length from the seat to the foot bar?" It's approximately 17.1 inches high. "My condo is on a lake where there are frequently very high winds. I need to know the weight of the items. Thank you,"
They are a good weight, but will blow over in high winds. You can tuck the chairs in diagonally, which pushes chairs against table legs, preventing them from tipping over...except the one on the opposite side of the wind sometimes. I had only on blow over when stored this way in a near-tornado gust at the coast. you could always bungee the legs together to the base, when tucked diagonally and away from the property, which I am sure would work. "i want to use this for a smaller patio. does it come w/ an option for just 2 chairs?" Unfortunately, we currently do not offer this set with only two chairs.